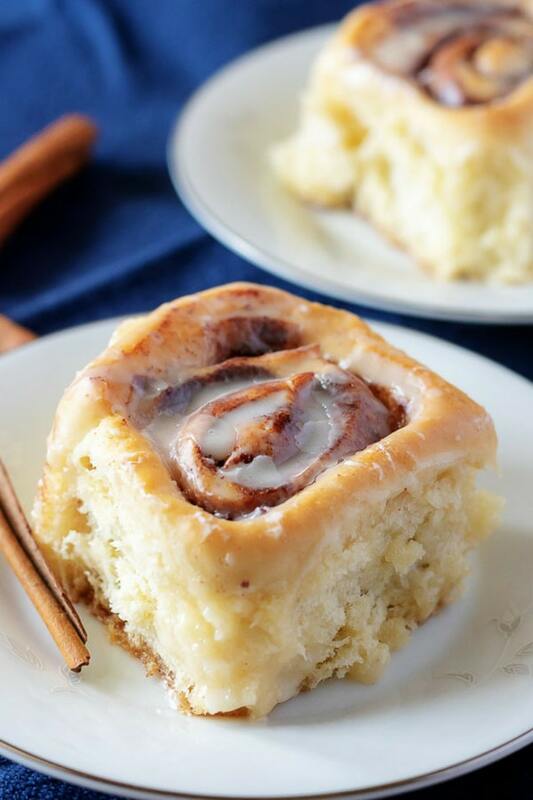 Homemade cinnamon rolls are one of the best breakfast, or desserts, around. 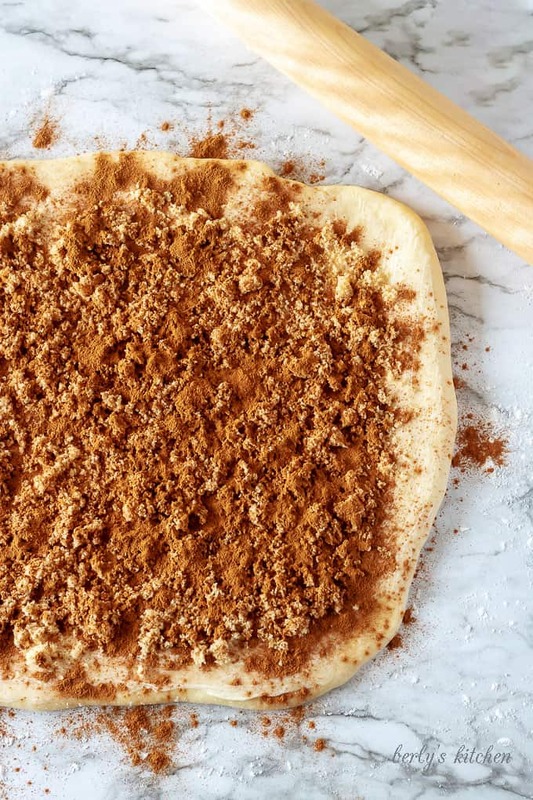 Our version is soft, light, and packed with brown sugar and cinnamon. After the cinnamon rolls bake to a beautiful golden brown, they’re drizzled with a sweet vanilla glaze. Who doesn’t like warm, gooey, cinnamon rolls from scratch? They are certainly some of our favorites. 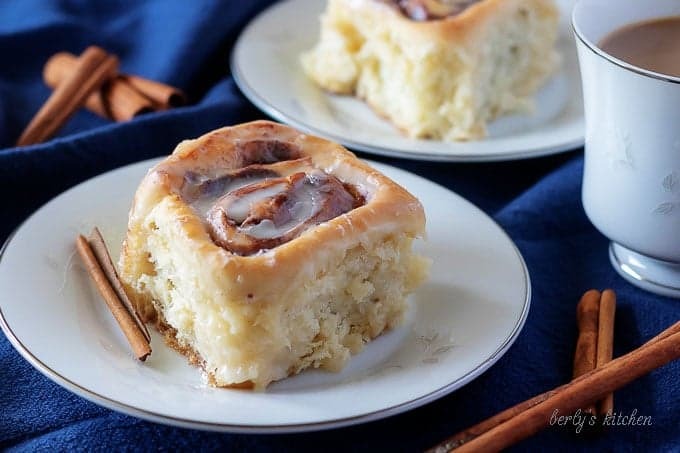 A few years ago I shared our easy cinnamon roll recipe with all of you, and I had no idea that it would become one of our most popular recipes. Since then we’ve added a couple more recipes to the mix. Now we have caramel apple cinnamon rolls and pumpkin pie cinnamon rolls. Both are popular during the Fall months! In regards to the original post, we’ve given it an update of sorts and added lots of step-by-step photos, extra instructions, and resources to help guide you along the way. There are a couple of different ways to make our homemade cinnamon rolls recipe. I’ve tried it both ways and both work great. However, the one that I’m going to list in the recipe card is the the version that we use in our kitchen. Before you get started, check the expiration date on the yeast. If it’s passed the expiration date, the yeast won’t activate and the dough won’t rise. I’ve made this cinnamon roll recipe with both active and instant yeast and have consistent results. Check out the tips at the bottom of the post to see the alternate version. Start by measuring 2 ½ cups of flour into a large bowl. Reserve the remaining flour just in case you need to add it later. It’s better to start with less and add additional flour as needed. Next, add the sugar, salt, and yeast to the flour. Give it a stir to combine the dry ingredients. Use a large measuring cup or microwave safe bowl to heat the water, milk, and softened butter. Don’t overheat the liquids. It only needs to be heated to about 110 to 115 degrees. Otherwise, it will kill the yeast. Transfer the flour mixture to the bowl of a stand mixer. Add the milk and water mixture to the flour then add the lightly beaten egg. Use the dough hook attachment and mix on low speed until all the flour is combined. This usually takes about 3 to 4 minutes. At this point, you should know whether or not the additional flour is needed. If the dough is wet, sticky, and stuck to the sides of the bowl, more flour is needed. Add additional flour about a tablespoon at a time. Stop adding flour when the dough pulls away from the sides and bottom of the bowl. It will also be smooth and soft to the touch. The dough shouldn’t stick to you fingers when touched. After any additional flour has been added, increase the mixer speed to medium and continue to mix 5 to 6 more minutes. Transfer the dough to a lightly floured service and roll into a rectangle. I was able to get a decent sized rectangle of 16-inches x 10-inches. This isn’t necessarily the size you’d have to roll out. It’s the size that normally works in our kitchen. Rolling out a larger rectangle will result in more cinnamon rolls but a thinner dough. A smaller rectangle will give you fewer, thicker cinnamon rolls. After the dough has been rolled out, spread the softened butter across the surface of the dough. Next, add the brown sugar and cinnamon. We use ½ cup of brown sugar and 4 tablespoons of cinnamon. Please use these amounts as a guide and adjust to your tastes. Starting with the longer side of the dough, carefully roll the dough as tightly as possible making sure the cinnamon/sugar mixture is on the inside. 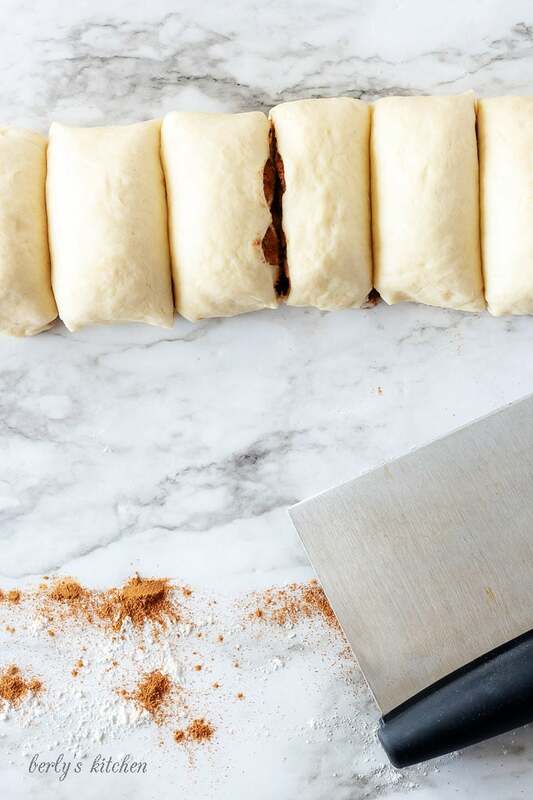 Use a sharp knife, pastry cutter, or dental floss to cut the length of dough in half. From there continue cutting even pieces until you have the desired number of cinnamon rolls. We normally cut between 10 and 12. Place the cut rolls into a greased 9 x 13 inch baking dish. Cover the dish with a clean towel or plastic wrap. Set the rolls in a warm area and allow them to rise. They should double in size. The amount of time this takes varies greatly on the temperature of your home and where you place the pan. We like to place the cinnamon rolls on the stove, and it usually takes about 45 minutes to an hour. During this time, preheat the oven. After the rolls double in size, place them in the oven and bake for approximately 25 minutes or until golden brown. 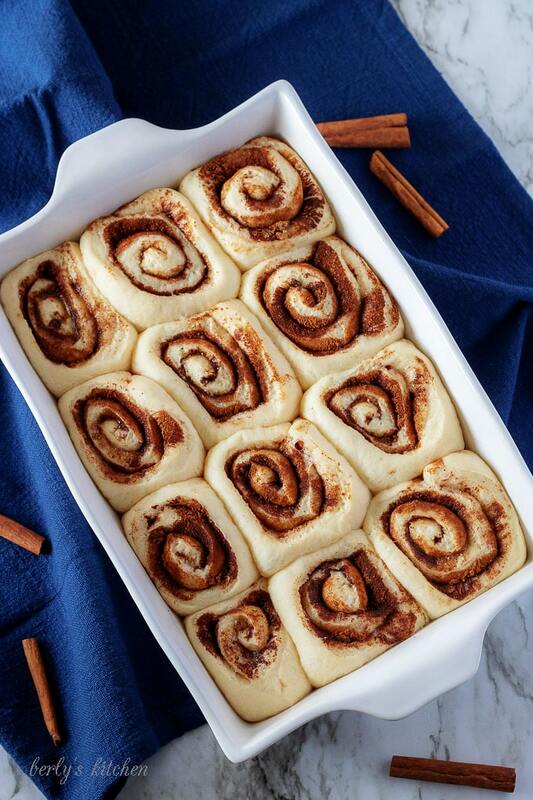 Remove the cinnamon rolls from the oven and allow them to cool completely before applying the icing. While the cinnamon rolls are baking, go ahead and make the icing. If you like a lot of icing, the recipe can easily be doubled. (Watch the video to see what the cinnamon rolls look like with a double batch of icing!) It makes just enough for a light coating. Whisk together the vanilla, milk, and powdered sugar. Add additional milk as needed to reach the desired consistency. 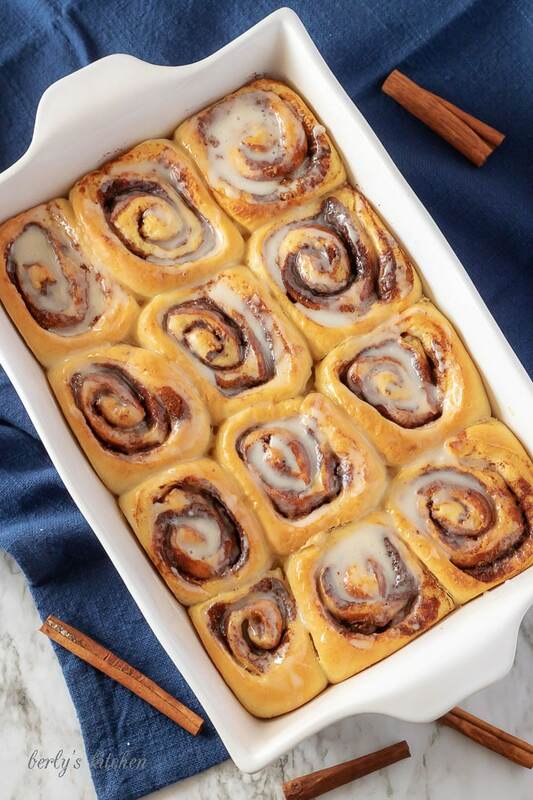 Use a spatula to apply the icing to the cool cinnamon rolls. Over the years we’ve heard from some readers that the yeast didn’t activate after being added to the dry ingredients. If you are using active yeast or have concern that the yeast isn’t being activated prior to being added to the flour mixture, here’s what we recommend as an alternative. Heat the milk and water as directed but leave out the butter. Stir in the sugar and yeast and allow the yeast to foamy and tan in color. Next, add it to the flour, salt, butter, and egg then mix as directed. Having trouble working with yeast? Here’s a great resource that may help out. As mentioned above, start by using less flour and adding more as needed. Different environments, altitudes, and weather will affect this recipe. I’ve used anywhere from 2 ½ cups to a little over 3 cups of flour depending on where I’ve lived and the outdoor humidity. If you live in the mountains, the bake time and temperature may need to be adjusted slightly. Check this out for more information about high altitude baking. Don’t over mix the dough. Just like adding too much flour will make it dense and tough, the same will happen if it’s over mixed. It needs to be smooth and elastic. Use the filling and icing amounts as a guidelines. Those can be adjusted to your tastes. We’ve made this recipe the way we like it, but your family may not like as much sugar or may want more icing. You may want to cut back the cinnamon a touch or even add extra. Play around and see what you like best! Did you watch our video showing how to make cinnamon rolls? I’ve listed the recipe for the icing in the “Notes” section of the recipe card. It’s a thick and creamy, double batch of the original. Love cinnamon rolls? You may also like Sticky Bun Braided Bread and Cinnamon Roll Oatmeal. 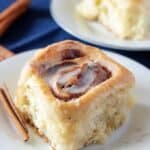 If you like this homemade cinnamon rolls recipe, please leave us a comment and rate the recipe card. You can also find us on Facebook, Pinterest, Twitter and Instagram searching for Berly’s Kitchen! Mix 2 1/2 cups of flour, sugar, salt, and yeast until well combined. Set aside. Heat water, milk, and butter to about 115 degrees. Using a dough hook on a stand mixer, mix on a low setting. Add remaining flour a Tablespoon at a time to form a smooth dough. Continue to mix for 5-6 minutes. Allow dough to rest for 3-5 minutes. Next, use a rolling pin to roll into a rectangular shape. Spread the softened butter on the rectangle of dough. Sprinkle evenly with cinnamon and brown sugar. Beginning with the long side of the rectangle, tightly roll the dough, so the cinnamon and sugar are on the inside. Cut the rolled dough into 10-12 even pieces. Place the cut dough into a greased 9 x 13-inch pan. Place rolls in a warm, draft-free place and allow to rise until doubled in size. Place rolls in the oven and bake for 25 minutes until golden brown. Whisk together vanilla extract, confectioners' sugar, and milk. Pour over cooled cinnamon rolls. *Check out our tips in the post for working with active vs. instant yeast. *Environmental factors cause the amount of flour required to vary slightly by region. We've linked to a great resource in the tips section of the post. *Recipe makes approximately 10-12 cinnamon rolls. *Calories listed are an approximate and based on the ingredients listed. *We have not tried to substitute ingredients such as gluten-free flour, bread flour, almond milk, soy milk, etc. and cannot provide recommendations on the use of alternate ingredients. *For the icing in the video, we used 2 cups powdered sugar, 5 tablespoons of milk, and 2 teaspoons of vanilla (a double batch). This made a thick and creamy glaze for the cinnamon rolls. The glaze in the photos was a single batch as shown in the recipe. At what stage could I refrigerate or freeze these delicious rolls? Just made these with my four year old daughter. They really are pretty easy and quick! I used a flour blend instead of pure white flower and they turned out great! We haven’t even put the icing on yet and they are delicious! Thanks for the recipe! ? Is it possible to do this by hand? I dont have a stand mixer. Hi, Tonia. Absolutely! Go ahead and mix the ingredients as instructed but instead of using a stand mixer, knead the dough with your hands like you would bread dough. You’ll have to knead it for about 8-10 minutes until it’s smooth and elastic. Awesome recipe!! Thank you for sharing! I was just wondering was the temp for the milk and butter is it 115 Fahrenheit or in Celsius? These look awesome! Can I make these as refrigerate over night and Bake in the morning? Hi, Kat! I haven’t tried to refrigerate them, so I don’t want to tell you wrong. However, here’s a great post that explains how to freeze cinnamon rolls and bake them. http://blog.kingarthurflour.com/2010/12/10/freeze-cinnamon-buns-in-20-minutes/ Maybe it can be of some help. Thanks for stopping by and for the comment! I want to try these for Christmas morning. How long does it take for the dough to rise, per step #14. Hi, Beth! If you put the dough in a really warm area, it may only take about 30 minutes. 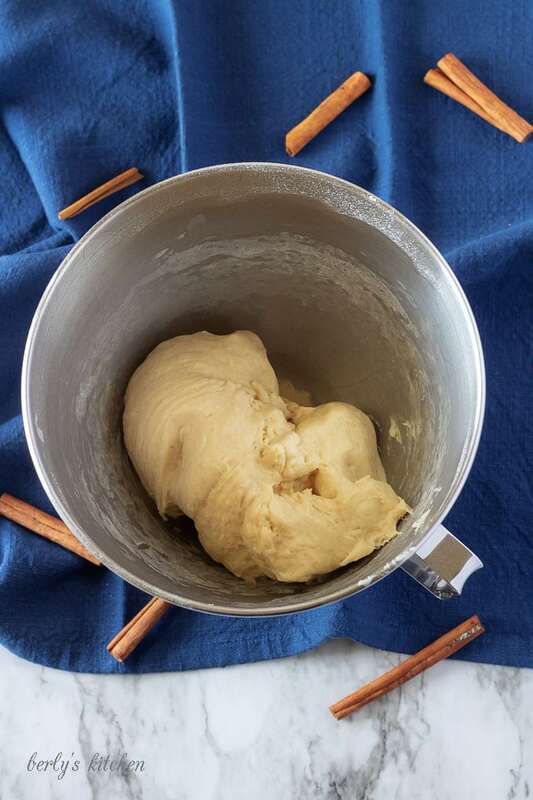 If you place the dough in a room temperature area, it could take 30 minutes to an hour. Using rapid rise yeast makes it rise faster, too. 🙂 Sometimes I will preheat my oven to the very lowest temperature (170 degrees), then turn it off. Next, I place the rolls in the oven to rise and crack the oven door. Just make sure the oven is turned off and don’t leave the rolls in too long, otherwise, they will dry out. Thanks for your question! Hello I’m new to this, how do I know when to pull them out is there a time frame (20min?) Or should they be so tall? Hey, Melissa! It takes around 25 minutes in our oven, but every oven cooks a little differently. The cinnamon rolls should turn a light to medium golden brown color then they can be removed from the oven. Sometimes they do bake up fairly tall. The weather, altitude, pan, oven, etc. all play a huge role in how these turn out from person to person. So I have probably a dumb question for y’all experienced bakers lol. But I’m just getting my feet wet in the kitchen. And when you say add the yeast to mixture, do you just open the package of yeast and pour the little seed like things directly into the mix or do you dissolve it first and if so with how much water? I really want to make these tho. Just don’t always comprehend all the kitchen lingo. Hi, Jillian! That’s not a dumb question at all. I’m glad you asked ahead of time and will update the recipe accordingly in case someone else wonders the same thing. 🙂 There are a couple of different ways to work with the yeast. This particular recipe works by adding the dry (active yeast) straight from the packet right into the flour and other ingredients. I use Fleischmann’s Active Yeast. However, if you don’t have active yeast, it should be activated ahead of time. In regards to the liquid for activating the yeast, use either the water or the milk already listed in the ingredients. Don’t add any additional liquid. Here’s a link to another post where my husband answered a yeast activation question earlier today. Hopefully, it will be helpful, too. https://www.berlyskitchen.com/brioche-buns/ Just a side note here, start off with less flour and add more as needed a tablespoon at a time. If you don’t need the full amount, don’t use it. 🙂 Weather, humidity, altitude and air temperature all play huge roles in baking. The exact amounts I use may not work for you. Please let us know if you have any more questions. I used active dry yeast and just mixed it with the flour sugar and salt as is.. are they still going to come out ok? Hi, Monica! That’s exactly how I make them, so they should work wonderfully. 🙂 If they don’t for some reason, don’t get discouraged. Please let us know and we’ll try to help you figure out how to make them work. I’ve decided to try your recipe, but don’t have a cooking thermometer. Is it possible to know if the butter, milk, and water have reached 115 degrees using another method? Hi Veronica! No worries. We don’t have a thermometer either. It broke a while back. My best advice is to test the liquid with your finger (it sounds silly, but it works). It should be slightly warm but not hot (no steam or bubbles). If it burns you, then it will be too hot for the yeast. My husband put it best when he said, it’s similar to heating up a baby’s bottle. I also highly recommend that you check the expiration date on the yeast prior to beginning, just to make sure it’s not expired. 🙂 If you’d like more tips, please check out the comment section in this recipe. My husband explained in depth how to work with yeast. It may be of some help. Please let us know if you have any other questions! Thank you for your advice! It turned out pretty well I think! As I am new to using yeast and taking on some harder baking recipes, I think I will get better over time. Thanks again for your help! Thanks for letting us know how they turned out. 🙂 Working with yeast takes practice, but keep at it. It gets a lot easier with time. Have a great day! Trying these today! 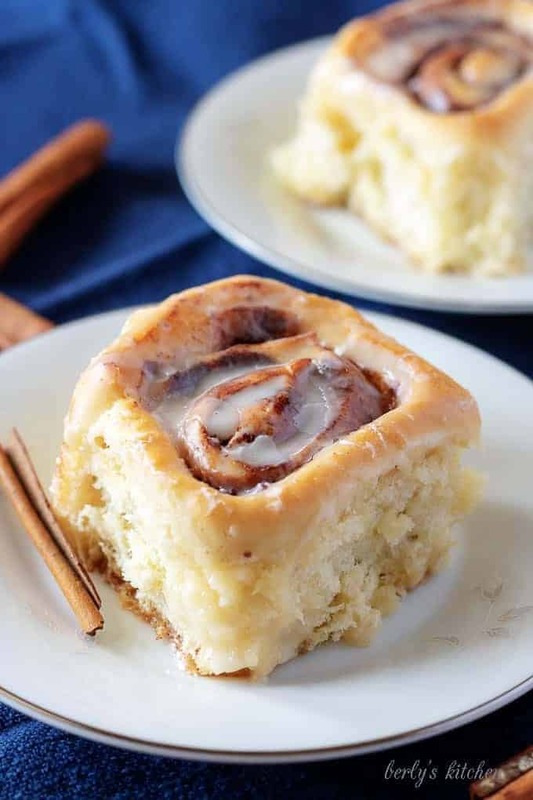 I’ve been looking for a good homemade cinnamon roll recipe and this one sounds perfect! I made these and followed the recipe. I thought it was odd for only 3 tablespoons sugar as I’ve always used more, but the comments said theirs all tasted good and I’m all for good tasting and less sugar. But sadly mine came out tasting like flour 🙁 I followed the recipe exactly so I don’t know what happened. They are definitely fluffy and I think next time I’ll add more sugar cuz these do look amazing!!! Hi Paige! Thanks so much for your comment. We’re glad you tried the cinnamon rolls and sorry they didn’t turn out. I double checked the recipe to make sure it wasn’t missing anything. 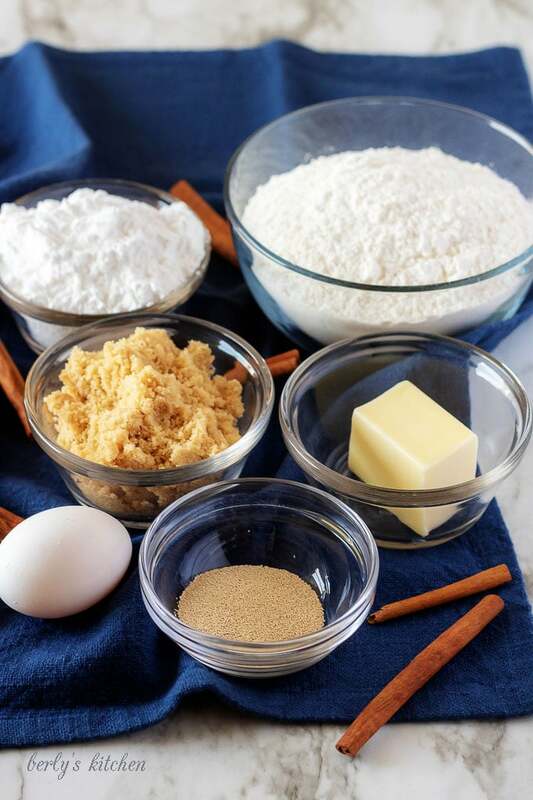 The dough calls for 3 tablespoons of granulated sugar and the filling calls for 1/4 cup to 1/2 cup of brown sugar in addition to the cinnamon and butter. Please feel free to add more to your taste. 🙂 We’d love to know how they turn out next time. Thanks again and enjoy the rest of your weekend! Can I make the dough the night before and bake them the next day? Hi, Melisa! Yes, you absolutely can. There is a link to King Arthur Flour’s site earlier in the comments that explains the best way to do it. Happy Holidays! How long do they hae to rise?Can i make the dough the night before, then bake them the next morning? Hi, Jenna! The dough needs to rise until it doubles in size. The time it takes can vary depending on how warm of an area you place the dough in to rise. Usually, ours takes about an hour. Yes, you can make the dough the night before and bake them the next morning. For the best practices on how to do this, please see this article from King Arthur Flour. I love these rolls they turned out great and were so easy to make. My husband loved them, thank you! Just made these, they taste amazing! The dough was so easy to work with. I was able to get fifteen nice size buns. Will definitely make them again. I’m making them this weekend *so excited* and Inwas just wondering to roll them, would you have the long side of the rectangle parallel with the counter edge and then roll them up? Thank you for your question Meliena. Yes, you’re correct, when rolling the cinnamon rolls, you will want to roll the long side of the rectangle up and not the short side. Otherwise, you won’t get many cinnamon rolls and they’ll be too thick to cook properly with the oven temp and time listed in the recipe. If you have any other questions, feel free to reach out to us again. You can either leave another comment or email us. Have a lovely day, Meliena! Good Morning, Amber, yes you did miss something. On the recipe card, right under the “Rise” section, it explains to place the cinnamon rolls in a warm, draft-free place and allow to rise until doubled in size. It’s the first instruction under the “Rise” section, so I’m not sure how that went unseen. However, I went ahead and verified everything is correct on the recipe card. Have a great day. Hi, thought I would share my make the night before steps with everyone who likes sleeping in in the mornings as I do. Placing my rolls in a greased glass baking dish/pan I then cover with lint free dish towel, set on upper rack in my oven and then place a large pan of very hot tap water in the bottom of my oven and shut the door. In 20 to 30 minutes my rolls have risen more than twice their sizes (which is ok cause they shrink a bit in the fridge over night) I wrap my rolls in the pan tightly with plastic wrap forcing any and all air pockets out, working in sections from one end to the other till fully sealed. I place in fridge till morning when I then take them out and do the oven, pan of hot water trick to get them room temp and let them rise back up. I then bake as directed adding 3 to 5 minutes more since the centers are cooler when starting. I usually can have the rolls done within an hour from the moment my kids force me out my bed. Hope this helps other non-morning people out their. Are these really supposed to have that much cinnamon in them? I ended up using about 2.5 tablespoons because I ran out and I’m happy I didn’t do the full 4-5 because my kids were complaining that the rolls burn their tongues. I liked them, but they were definitely VERY cinnamon-y. And I did do the full 1/2 cup brown sugar, so it probably would have been even more overwhelming with only 1/4 cup. Thank you so much! These were really delicious even with a lot of cinnamon (I’ll try less next time though). So delicious I made a second batch with strawberry jam in them the same night. Thanks for sharing! Got a new stand mixer this weekend. Never made cinnamon rolls before, so this was my first try. These came out wonderful. Thank you for making my first experience a wonderful one. The best recipe that I’ve tried! Fluffy, thick and sooo delicious! Thank you for the recipe. Hello, I am wondering if there’s a way to make these using a hand mixer. I don’t have a stand mixer and I know they are expensive… what did they do in the days before stand mixers? Lol! Thank you for sharing this recipe. My family has been extremely pleased with the results every time, and wait the next batch on edge! I have been happy to serve them this greatness thanks to this post! Great recipe, and I will look into your others. Keeping sweet hunters happy!